My sister was diagnosed in 2003 with a debilitating and painful disease called reflex sympathetic dystrophy. After many tries with various treatments and pain medicines, she finally found partial relief through opioid medicines [“Opioid lawsuits fought,” News, March 20]. She recently moved from Arizona to New York to be near her family, which can help her live more easily and comfortably. In New York, my sister has been turned away from pain-management clinics and doctors. She needs a heavy load of pain medicines to live even a semblance of a normal life. Recently, she has expressed suicide as the only way to get relief. She does not abuse her medicine and takes it as directed. The changing regulatory guidelines limiting doses leave chronic pain sufferers with nowhere to turn. I was disturbed and outraged by an editorial cartoon on March 17 [“Cartoon Roundup,” Opinion]. The rank and file of Suffolk County’s officers are fully committed to the program to keep schools safe, as laid out by County Executive Steve Bellone, Police Commissioner-designee Geraldine Hart, Acting Suffolk County Police Commissioner Stu Cameron, and the Office of Emergency Management. It’s unfair and false to suggest something less. A recent meeting of police and school superintendents in Hauppauge was filled to capacity and ran overtime. The partnership and commitment of all were clear. Fine men and women might be running into schools, disregarding their own safety, to face gunfire and a shooter should, God forbid, such an event happen in Suffolk County. That cartoon on the Opinion page or any other page in Newsday is a slap in the face. School security is not a joking or laughing matter. Editor’s note: The writer is a retired assistant commissioner for the Nassau County Police Department. 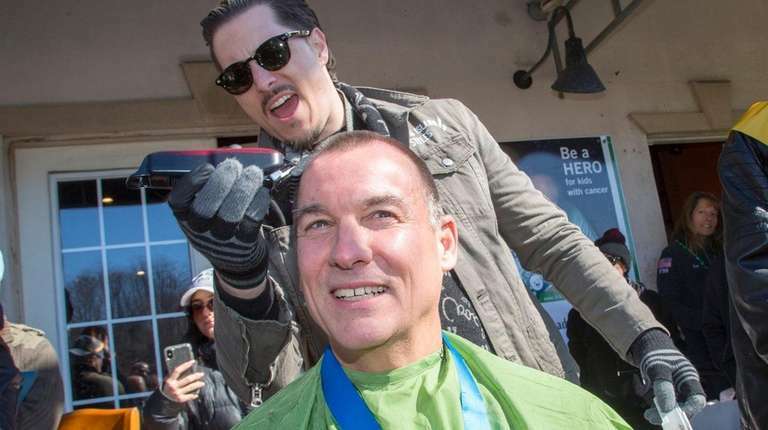 Rep. Thomas Suozzi had his head shaved as part of a St. Baldrick’s Foundation charity fundraiser for cancer treatment [“Let hair be light,” News, March 19]. This organization raised more than $39 million last year alone. That said, the overall cost of cancer treatment in the United States is estimated to be between $150 billion to $200 billion a year. The only way to ensure that every cancer patient in America gets the proper treatment is to create a single-payer, Medicare-for-all system like those in other major countries. This would dramatically reduce the costs of treatment and cover everyone. While Suozzi raises funds for cancer treatment, he opposes the creation of a single-payer health care system. Editor’s note: The writer is on the steering committee of LongIslandActivists.org, which advocates for universal health coverage. New York State ranks a shameful 41st in the nation when it comes to voter turnout [“Crunch time for state budget,” Editorial, March 25]. Perhaps this is related to the fact that we are one of only 13 states without any form of early in-person voting. The League of Women Voters applauds Gov. Andrew M. Cuomo’s plan to address this situation, not merely with words, but with a $7 million appropriation in his 2018-19 budget. The plan would require every county to establish one to seven locations for 12 days of voting before every general, primary and special election. This would be a real-world help to citizens with disabilities, students and, especially, working people who cannot get to a polling place, for whatever reason, during the workday. Early voting does not favor any one party, it simply increases access to voting for all. Editor’s note: The writer is president of the League of Women Voters of Nassau County. I’m writing to complain about Lane Filler’s column on March 7, “How the Trumps could really cash in” [Opinion]. I found it particularly offensive. It almost seems as if Filler encourages President Donald Trump to sell facets of his presidency for his and his family’s gain. As it is, the president goes out of his way to prevent running afoul of the emoluments clause by having his family members handle his businesses. I think Filler’s glibness is being used in the wrong place. It might be Filler’s attempt at lightheartedness, but I find it totally repulsive.